(Beijing, 2 January 2017) The just past 2016, is the beginning of the 13th Five-Year Plan, when the addressing of climate change by the forestry has made tremendous progress. CGCF has attached great importance to fund raising and project implementation under the leadership of the communist party of SFA (State Forestry Administration). Meanwhile, by such measures as system research & building, scientific research, international cooperation, propagandization & stimulation, CGCF has done a good job in disseminating and demonstrating the function and role that forestry has been playing in economy and society development, especially in addressing the climate change, as well as the special charming that CGCF displays as a public service organization. We respect the desire and commitment of the donors, supervise and manage the whole project implementation, set up the zero-distance communication mechanism with the donors and make them be aware of the project progress and the consequences at any time. We invite the donors to take part in the project opening ceremony and experience the hardness and happiness of the afforestation activities so that to reinforce their knowledge and awareness of the forestry. We also adopt the suggestions of the donors to scheme the related seminars, investigations and invite them to join in. We try our best to coordinate and satisfy the reasonable appeal of the donors, even if it might go beyond our professional scope. e.g., we coordinated with Spring Airline Group to host the seminar with the topic of “ecological remediation and under-forest economy in Kangbao County” to give constructive suggestion to the ecological restoration and under-forest economy in Kangbao County. 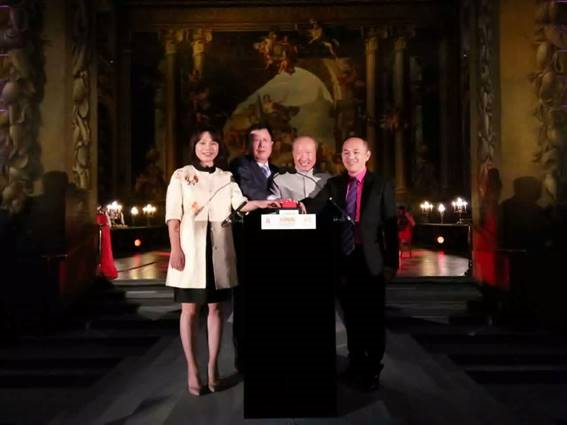 Due to our professional, dedicated and careful service, we have won the fully affirmation of Hong Kang Jockey Club. It has donated Hong Kang $3,000,000 every year continuously for four years to plant trees in Longchuan, Guangdong province for the conservation of Hong Kong’s drinking water source–Dongjiang Source. Also, due to our professional and expertise in addressing climate change in forestry, the Laoniu Foundation, which is enthusiastic about environmental protection public welfare, has become our major donors and important partner. Laoniu Winter Olympics Forest Carbon Sequestration Project, with the budget of RMB 185 million Yuan, has gone to the project implementation phase. The donation project and funds by the international institutes and organizations to China has decreased obviously under the guidance of international public opinion of “China Rising” and the continuous adjustment of the global economic order. Abiding by the aim of addressing climate change and promoting the sustainable development, we practically strengthen cooperation with the international institution, actively explore the integration of technology and funds so as to implement Chinese project and solve the global problem. We have achieved substantial breakthrough and innovation in applying the international donation project and cooperation. We have successfully applied for the “Community Conservation and Development Special Fund” with grant of $750,000 and “Fighting against the Trafficking in wildlife” with donation of $400，000. We have been advocating the public welfare brand activities of carbon neutral forest with the target of “zero emission” in 2010, i.e. by forestation and carbon sequestration raise to absorb the carbon emissions of the activities, conferences, production and business travel. Its technology and standard has become more and more mature over the past six years. It has displayed and propagandized the function and role that forestry has been playing in addressing the climate change in a scientific and visual way and has become our activities’ project brand with the ever-increasing influences at home and abroad. The G20 Hangzhou Summit in 2016 is obvious China’s most important home diplomacy, as well as the international summit with the highest level, largest scale, most profound influence that China has hosted recently. 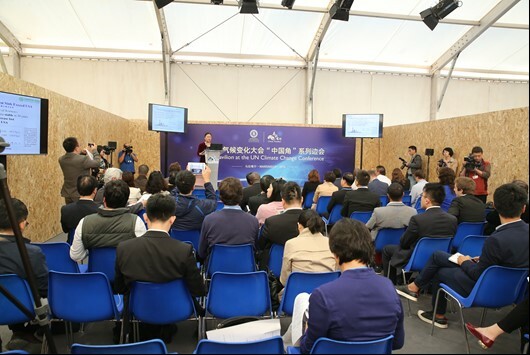 In order to exhibit our determination, actions and responsibilities to insist on the low carbon and green development, we, together with Forestry Department of Zhejiang Province schemed and organized the launching ceremony of carbon neutral project for the summit. The ceremony, co-hosted by the SFA and People’s Government of Zhejiang Province, was held in Hangzhou, the summit host city on Aug 22th, 2016. 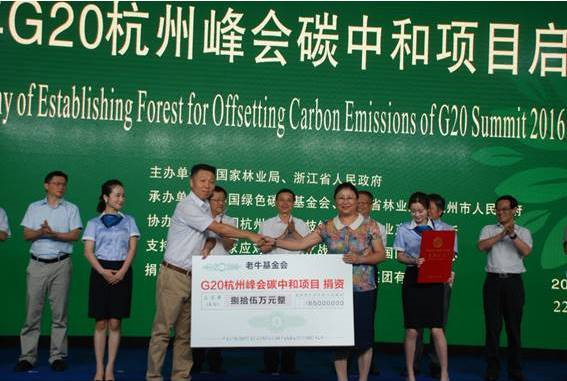 G20 Hangzhou Summit is calculated to emit about 6,674 t CO2e, which is neutralized by planting forest donated by Laoniu Fundation and Wanma united holding Group, Co., Ltd. in Taihuyuan Town, Lin’an City, Zhejiang Province to realize the target of zero emission. This activity delivers a positive signal to the world that Chinese government is hosting the summit in a low-carbon and environmental friendly way, which practices the sustainable spirit that G20 is advocating. G20 Hangzhou Summit therefore has become the first low carbon summit to offset its carbon emissions by afforestation. In 2016, CGCF also plot the carbon neutralization forest for the 5th International Forum on Clean Energy (Macao). The 2016 United Nations Climate Change Conference was held in Marrakech, Morocco from Nov 7th to 18th. November 9, China Pavilion at the UN Climate Change in Marrakech kicks off its first side event. The event with the theme of “Ecological Management Improves Human Well-being, is co-organized by the Department of Climate Change of China's National Development and Reform Commission (NDRC) and CGCF, attracting nearly one hundred representatives from international organizations and more than 20 countries including America, Britain, France, Germany, Russia, Norway, Malawi, Colombia, Mexico, Spain, Ukraine, Indonesia, China and Morocco. The side event is presided over by Li Nuyun, Deputy Executive Chiarman of CGCF and John O'Neills from the University of California, San Diego. Ji Xie, Director-General of Department of Climate Change, NDRC, addressed the opening speech. Such famous professionals and scholars as Dr. Hans Friederich, Director-General of International Network for Bamboo and Rattan (INBAR), Dr. Grace Wang from the Center for International Forestry Research, Dr. John O'Neills from the University of California at San Diego, Chunfeng Wang, Deputy Director of the international cooperation Department, SFA, Professor Nuyun Li, discussed the theory, practice and experience to try to realize the peaceful co-existence of human and nature by mobilizing and guiding all kinds of resources, actively taking part in the regional ecological management with substantial measures like policy leading, mechanism innovation, scientific research, public education and community attendance. CGCF attends the Climate Change Conference every year and has hosted or co-hosted the side event for the conference and China Pavilion since it became the observer organization of United Nation Framework Conversion on Climate Change (UNFCCC) COPs in 2012. The TV Programme Morning News in news channel of CCTV-13 reported the video in the first time. The Xinhua Network made detailed broadcasts with both pictures and texts with the headline of “China Pavillion Opened on UN Climate Change Conference”. Meanwhile, the media like China Science and Technology Network, China Economic Net, China Green Times all reported or forwarded this news. Xie Ji, the deputy director of China Governemnt Delegations gave highly appreciation and warm congratulations to the successfully host of the side event. Based on the unified deploying and arrangement, the board of directors changed term and the reelection meeting of CGCF, i.e. the 1st session of the 2nd board of directors, was held successfully in Beijing on Nov, 4th, 2016. Mr.Yongli Zhang, the Vice Administrator of SFA attended the meeting and addressed speech. Yongsheng Du, the full-time deputy commander of national forest fire prevention headquarters was selected as the second Chiarman of the board of directors, CGCF. The second board of directors has 15 members. Diancheng Shen, Wei Zhao were selected as the deputy directors of the board of directors, Nuyun Li, the deputy executive director, Kan Deng, the secretary-general. Du Yongsheng pointed out that the second board of directors will adhere to CGCF’s principles, burden the responsibility to promote the development of public welfare of green carbon sequestration, actively to raise funds, manage the donation project carefully, propagandize intensively the green carbon sequestration public welfare, enhance CGCF’s social influences continuously, reinforce the team building and management, substantially push CGCF’s public welfare to develop in a healthy and continuous way. At present, the daily work of CGCF, deployed and researched by the secretariat under the guidance of the party member of SFA and the board of directors, is going on orderly and harmoniously. CGCF is determined to push the green carbon sequestration public welfare in a more efficient and qualified way with more professional standard, more careful and more practical style, more efficient and qualified product, persisting on the past beneficial experience and obtain outstanding achievements in the future. By concentrating on the national strategic planning of addressing the climate change, integrating with the national plan to set up the nation-wide carbon emission trade system, considering the adaptive actions of different institutions, CGCF scheme the public welfare project innovatively to respond and satisfy the public welfare needs of the related enterprises and institutions in the green and low carbon development age. CGCF has initiatively plot the public welfare project with customization and personality. Firstly, a series of projects such as Hainan Carbon Sequestration Forest donated by Hainan Airline Group, Carbon sequestration forest project for the protection of mangrove forest, wetland conservation and poverty alleviation with targeted measures have been designed based on its carbon sequestration forest project plan for ecological protection published on the Britain-China Film Festival to satisfy the needs of Hainan Airline Group to fulfill its social responsibilities, enhance Hainan people’s capability to adapt to and mitigate the climate change. Secondly, CGCF has contracted with Gaoligongshan Ecological Tea Co., Ltd in Tengchong County for three years, authorizing it to produce the certified public welfare tea labeled with carbon emissions for the first time in China. Thirdly, CGCF signed the cooperation agreement with Hermes (Shanghai) Trading Co., Ltd, accrediting it to produce the limited edition scarves using CGCF’s Logo, the revenue will be donated to CGCF proportionally for the public welfare project. CGCF implements the project development program and project management system strictly and develops the forest carbon sequestration projects that are in compliance with the related international and domestic standard. In addition to the completion of projects like Laoniu Winter Olympics Carbon Sequestration Forest Project with the area of 6,000 Mu, Hong Kang Jockey Club Dongjiang Source Carbon Sequestration Forest Project, the smoothly implementation of Kangbao Ecological Restoration Forestation Project by Spring Airline Co., Ltd, the following projects have also been explored. Firstly, CGCF has supported the regional entities to develop CCER projects including carbon sequestration forestation projects, bamboo carbon sequestration forestation projects and improved bamboo forest management projects. 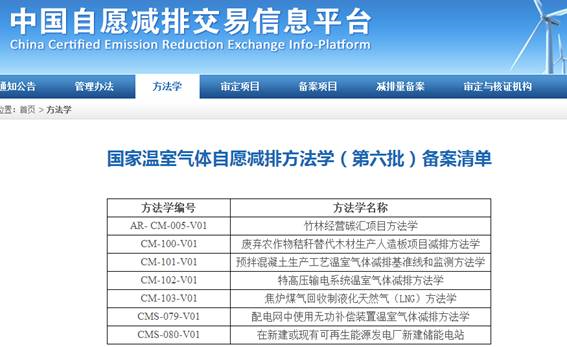 Secondly, the improved forest management (IFM) projects developed under VCS like Inner Mongolia Chao’er IFM project, Kunming Liangqu IFM project have been registered and issued successfully. 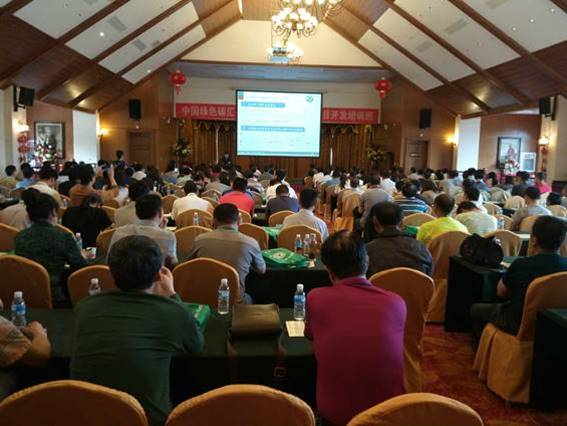 Fujian Yong’an IFM project and Yunnan Xishuangbanna IFM project has completed the validation and verification process and will get registered and issued recently. Thirdly, CGCF implemented the Project of 2016 Annual Summit of China Green Companies, carbon neutral forestation project for the zero carbon emission wedding celebration. Fourthly, CGCF has started the project collection mechanism in public. Once the above projects traded successfully, they will become the innovation of the national ecological benefit compensation auxiliary mechanism. CGCF’s first openly collection of the donated public welfare project to the society via the internet, has also achieved warm welcome and active participation by the public. Based on the overall requirement of the ecological civilization construction, integrated with the actual needs of the current reform of the collective forest region and state-owned forest farm, CGCF has hosted two phases forest carbon sequestration trading project development and forest therapist training in Tengchong, Yunnan Province to serve and support the forest central work, altogether 480 people received the training. Meanwhile, In order to coordinate the pilot reform of the stated-owned forest farm, CGCF has subsidized the regional state-owned forest farm to set up the forest sanatorium with integrated functions of both training and demonstration. It has become the new way to explore the marketization of the forest ecological service and has fully fulfilled the multiple benefits of the forest and realized the mechanism innovation of the forest ecology benefits compensation, which has opened new channel to improve the living standard of impoverished people in the underdeveloped region and poverty alleviation with targeted measures by the forestry and provided demonstration for the exploration experience of the change from the green hills and clean water to golden and silver mountain. CGCF has always been devoted to the forest carbon sequestration scientific research and CCER methodology research and building of the forest carbon sequestration projects, providing theoretical support and system suggestion for the national climate change policy making, playing the relevant role of forest to address the climate change. Firstly, CGCF cooperated with UBC to start the study on China’s forestry carbon trade and the effective approach to link global carbon market after COP21. Secondly, CGCF pushed the development of methodology on Improved Bamboo Forest Management and its registration in NDRC. 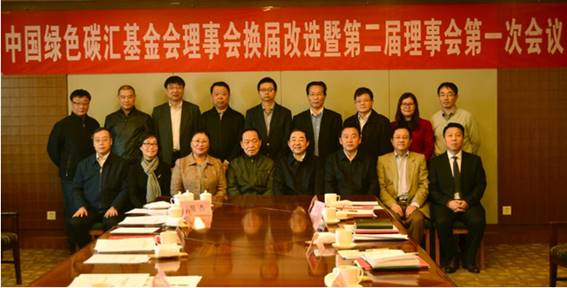 Thirdly, CGCF cooperated with Zhejiang A&F University to transfer the CCER methodology of Improved Bamboo Forest Management to the related VCS methodology and cooperated with VCS organization to transfer the VCS methodology to the domestic CCER methodology. Fourthly, the research and building for methodology on carbon credit to protect the elephant’s habitat has been started. Propagandization is the first step of all work, especially for the new concept and new knowledge of green carbon sequestration, should be dominated and introduced with special care without extra restrictions. Our major measures include: Firstly, as required by the local carbon emission trading institutes and local forest authorities, CGCF has given special topic lectures many times for the forest carbon sequestration trading development training to help the local entities to develop the forest carbon sequestration project in a scientific and normative way. Secondly, CGCF held the 6th Planting trees Festival titled “To Green the Country, To Act in a low carbon Way” and the 3rd China Green Carbon Sequestration Festival with the theme of “spread green idea, push the green development”. Thirdly, CGCF cooperated with China Wildlife Conservation Association and Wildlife Conservation Society to jointly host the award ceremony for guard actions to fight against the trafficking in wildlife titled with ‘to salute the guard, to jointly protect the creatures’. Fourthly, CGCF held China’s first scenic zero-carbon wedding in Suzhou Humble Administrators Garden. It also organized the starting of little guard foundation, i.e. 2016 public welfare planting trees activities， attracting a large number of famous artists in show business to attend. Fifthly, CGCF strengthened the regular guidance and management to the voluntary workstation, hosting two trainings for the principal of the workstation, establishing 29 green carbon sequestration volunteer workstations, in total, there are 44 all over the country. 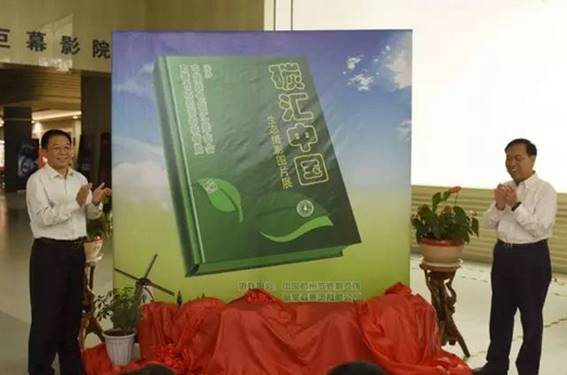 Sixthly, CGCF, together with afforestation department and service bureau of SFA plot the special edition propagadizaiton with the headline “Green development—China Forestry has prosperous future. Seventhly, CGCF implemented the ecological photo contest titled “Carbon sequestration in China”, and hosted the one-month length exhibition of the award-winning works in Hangzhou, Zhejiang Province and Hulunbeir City, Inner Mongolia Autonomous Region. The above activities all have gained the attraction and have been timely reported from the new media, traditional media and government website, resulting in better social benefits. CGCF has expanded and promoted the external propagandization through such channels as international conference, project cooperation and personnel training. Firstly, CGCF participated in the World Conservation Congress (WCC) of International Union for the Conservation of Nature (IUCN) and co-host the side event with Institute of zoology, Chinese Academy of Sciences. Secondly, CGCF took part in Brazil conference of New Generation Project (NGP) of World Wide Fund for Nature (WWF) for plantation and addressed speech with special topic. 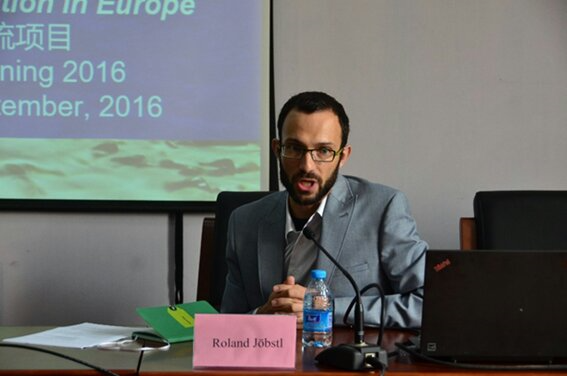 Thirdly, CGCF, together with INBAR, co-host the international seminar on Bamboo Forest Carbon Sequestration, Landscape Restoration and Sustainable Utilization, and carried out the corresponding training. Fourthly, CGCF attended the International Union For Forest Research Organization (IUFRO) Regional Congress for Asia and Oceania, and delivered the speech with special topic. By these activities, Chinese professionals introduced Chinese experience and talked with the international peer about the Chinese stories and broadcast the Chinese voice by the authorized media and disseminated the successful experience and innovative practice about Chinese forest to address the climate change, demonstrated the positive contributions that Chinese Forestry have been made to tackling the global climate change and communicated with the international peer about the experience and achievements timely. 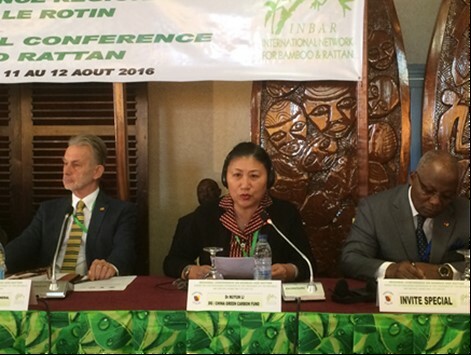 Nuyun Li is giving presentation on “international seminar on Bamboo Forest Carbon Sequestration, Landscape Restoration and Sustainable Utilization” in Cameroon, Africa. Based on the deploying of the communist party office of SFA, CGCF has implemented the “Studies on the Theoretical and Practical Issues of Party Building” education and the practice of“three strength, two promotions” to promote the party member to study and practice the party constitution voluntarily. By holding activities like Chairman giving party classes, secretary-general addressing with special topic, CGCF will follow the guidance of general secretary Jinping Xi’s series of important speeches to guide the practice and promote the daily work. CGCF support the non-party personage to fulfill their responsibility lawfully and endeavor to do a good job on the united front work. CGCF hosted the speech contest to honor the 95th anniversary of the communist party titled “Studying on the Theoretical and Practical Issues of Party Building, Advancing the Party Member’s Characteristic”. CGCF also take an active part in the training that hosted by party committee and the personnel department of SFA. CGCF pay attention to masses work, encourage its career to attend the diverse recreational and sports activities. It also sent two members abroad for the short-term intensive training by channels of external assignment of the visiting professionals and personnel exchanging with the international institutions. Addressing the climate change is of vital importance to human being’s survival and development. CGCF will keep realistic and practical, be initiative and innovative, stay true of the mission and scale the heights to serve the forest central work, enhance the ecology environment, contribute more to addressing the climate change and enhance the human being’s welfare.